I’m always intrigued by huge bases because generally a prolonged period of contraction leads to an extended period of expansion. By far this is my favorite set up. No one has a better “basing” definition than Stan Weinstein, author of Secrets For Profiting In Bull and Bear Markets. The Basing Area: “After XYZ has been declining for several months, it eventually will lose downside momentum and start to trend sideways. What’s actually taking place is that buyers and sellers are starting to move into equilibrium, whereas previously the sellers were far stronger, which is why the stock had plummeted. Volume will usually lessen–dry up–as a base forms. But often volume will start to expand late stage 1, even though prices remain little changed. This is an indication that dumping of the stock by disgruntled owners is no longer driving down the price. The buyers who are moving in to take the stock off their hands are not demanding any significant price concession”. Today we are going to focus on Emcore ($EMKR). 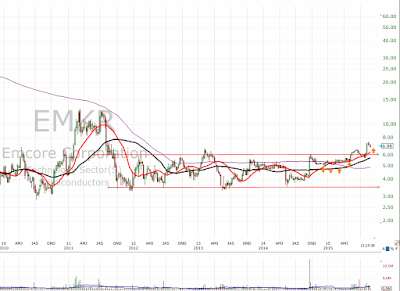 Emcore right now is sitting on top of a 4 1/2 year base after breaking it in the week of 7/31/15. All this while the market has been under severe pressure. 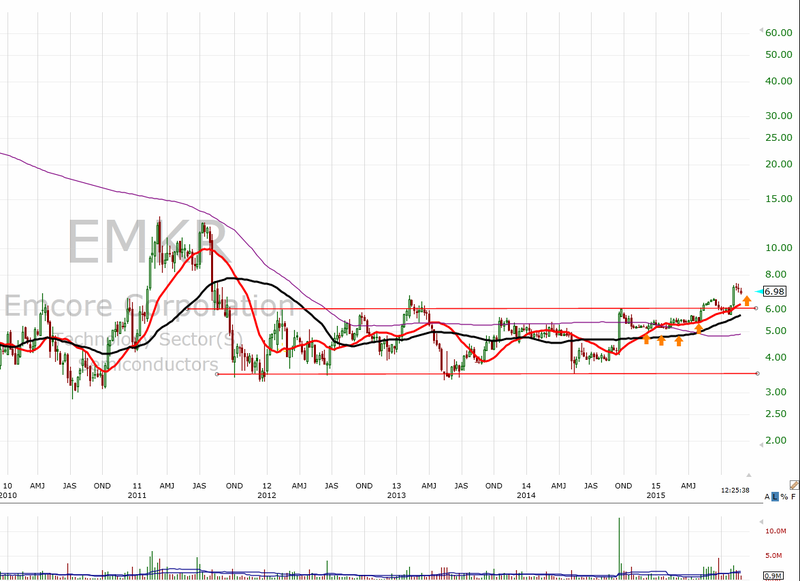 If and when some market pressure is relieved it should bode well for $EMKR. Typically you see bases ranging from 6 to 9 months long, a 4 1/2 year base is massive and one we should pay close attention to. Relative to its sector, the Semiconductors, the stock has shown incredible relative strength as well. Here is where the story gets juicy. Emcore’s market cap is about $176 million dollars and roughly $141 million dollars in cash. They also $458 million in NOL’S (Net Operating Losses). In addition, the company just bought $45 million dollars worth of its stock, equal to roughly 25% of its market cap. This makes it an ideal activist situation.